Weekend rates are available from collection on Friday 4pm until returning the vehicle on Monday morning before 9am. So, you only pay for 2 days hire, but get almost 3 days rental! 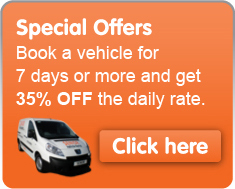 Daily Value Van Hire for Walsall, Wolverhampton, Birmingham & the West Midlands.